After the mass shooting at Marjory Stoneman Douglas High School, students at this school, along with many other schools in South Florida, organized a walkout on Feb. 21, urging change and remembrance of the 17 who lost their lives on Feb. 14. Nathaniel Tackett and Camila Duarte organized the walkout and were happy with the results. Tackett was pleased with the enthusiasm before and during the walkout. “Everyone got really involved and passionate about it, and a lot of other people decided to take it upon themselves to make more walkouts and get passionate about it,” he said. 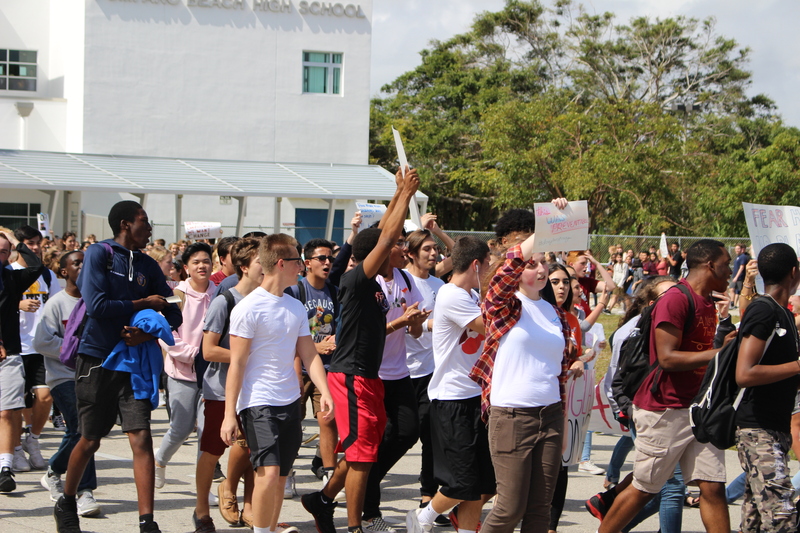 “So that was really good.” Another group planned and executed a second walkout, traversing the 16 miles between this school and Stoneman Douglas on Feb. 27, getting over 75,000 “likes” and 20,000 re-tweets on Twitter. The next day, junior Allie Tomaini organized a walkout after B Lunch, meeting up with Blanche Ely High School students at Pompano Beach City Hall.